Hi everyone, Nicky here from Kitchen Sanctuary with a meaty recipe for all of those carnivores out there! I’ve be on vacation to Greece lots of times over the years, and my favorite food over there has to be the classic street food dish – the Gyros. 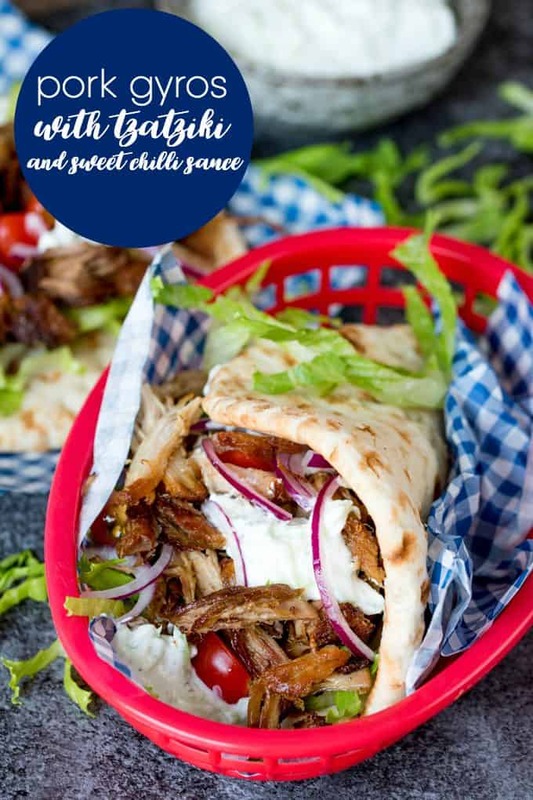 Often made with pork, it’s cooked on a vertical rotisserie similar to a Turkish doner kebab. 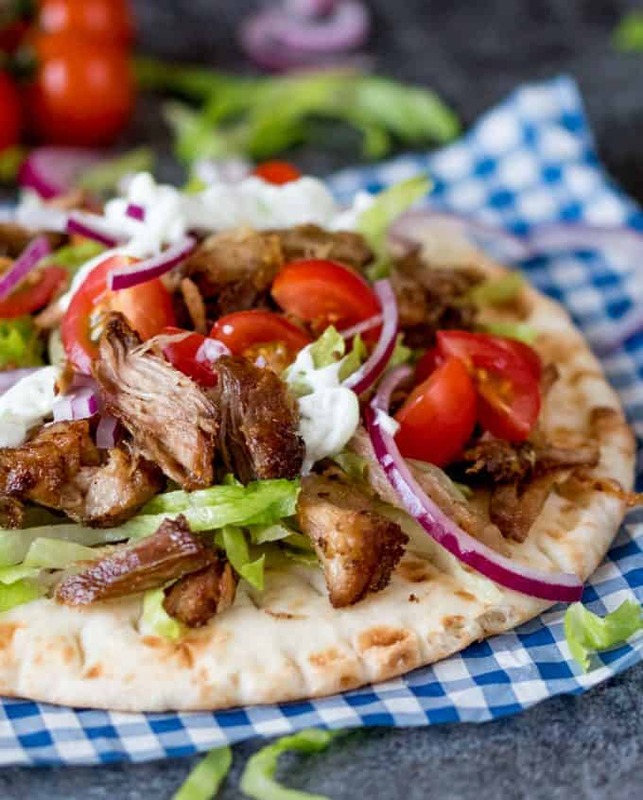 Often people think that gyros is made with ground meat, but if you ever try it, you’ll see it’s made of little chunks of well-seasoned pork (occasionally chicken too). I haven’t got a vertical rotisserie at home, so instead I cook a rolled shoulder of pork in a dutch oven with some stock, salt, herbs and spices. Once the pork is tender enough to shred, I pull small pieces off and shallow fry them in a little hot oil. Cooking twice in this way, means the pork is flaky, tender and full of flavour from the slow cooking. The final frying stage adds a caramelised crunch (you know how everyone fights over the outside slices of a roasted joint of meat? Frying the pork pieces up means that every piece tastes like the outside bit!). 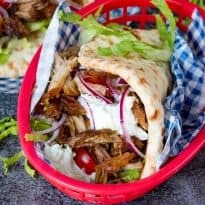 The pork is best served in a Greek style pita bread (such as the Pita Delight brand), with salad and a good spoonful of tzatziki. I’ve included my recipe for homemade tzatziki in the recipe below too. Finish it off with some sweet chili sauce and you’ll be in Gyros heaven! You might also like this Hoisin Chicken BLT Sandwich. 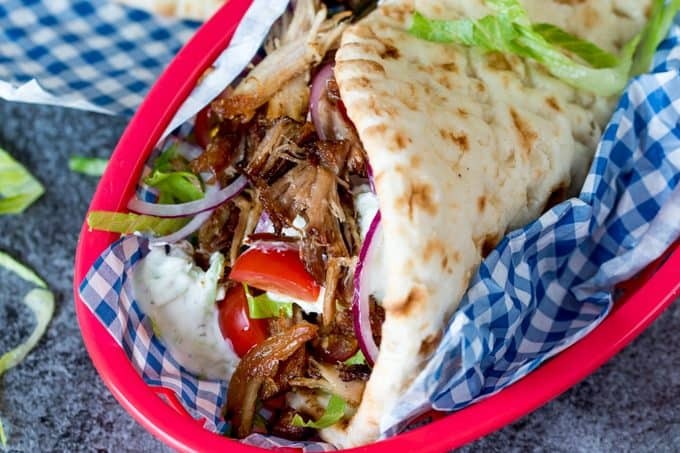 This recipe for pork gyros is a keeper – one taste and you’ll be hooked! 4 pound boneless rolled pork shoulder joint with rind (it sounds like a lot, but there’s quite a lot of fat which renders down, and also the rind which is removed after cooking). Preheat the oven to 350f. Mix together the celery salt, cumin, garlic salt, ground coriander, oregano, paprika, salt and black pepper on a plate. Roll the pork joint in the spice mix so that all the meaty sides are well covered (no need to cover the rind). Heat 2 tbsp of the oil until hot in a dutch oven or large thick-based, oven proof pan. Sear the meat on all sides (except the rind side), then add the garlic and stock. Bring to the boil, then turn off the heat. Place a lid on and place in the oven to cook for 2 ½ – 3 hours – until you’re able to pull the meat away easily with a fork. Check the pork a couple times during cooking to ensure there’s always some liquid in there. If it starts to go dry, top up with half a cup of hot water from the kettle. When cooked, take of the oven and remove the lid. Next make the tzatziki. Peel the cucumber and slice in half, lengthways. Remove the seeds by scooping them out with teaspoon. Grate the cucumber with a hand grater, then squeeze all of the liquid out using clean hands. Place the squeezed out cucumber in a bowl and add the rest of the tzatziki ingredients. Mix together, then cover and refrigerate until ready to serve. Carefully remove the meat from the pan and place on a chopping board. Discard the cooking liquid (it will be very salty). Discard the pork rind too. Pull the meat into small chunks using two forks. Heat the remaining oil in a large skillet and add the pork. Fry on a high heat, turning a few times during cooking, until golden brown (about 6-8 minutes). You may need to do this in two batches, depending on the size of your pan. Place the pitas on plates along with the lettuce, tomato and red onion. Top with the gyros meat and the cucumber tzatziki. Drizzle with sweet chili sauce before serving.